The University of Champions just keeps going! The University of Cebu Dance Company was awarded as the Best Folkloric Dance Troupe during the Korean World Travel Fair and Expo held at the Center of Exposition in Seoul, South Korea from June 7 to 10, 2012. The UC Dance Company wowed the crowd of over 100,000 travel industry professionals, buyers and specialists and travel consumers who participated in the travel fair. They performed at the Philippine Booth and at the main stage of the Korean World Travel Fair and Expo dances from the various festivals of Cebu province — like the Palawod Festival Dance, the Karanza Festival of Danao, Bonga of Sibonga, Torta of Argao, Hinulawan of Toledo, Sarok of Consolacion and Sinulog of Cebu. This is the second time that UC won a similar award. The first award was in Busan for the International Travel Fair held last September 11 to 14, 2009. 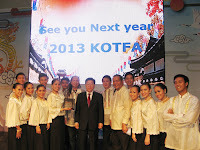 This time it was a twin win for the Philippines having won the Best Folkloric Performers and the Best Booth awards. The Korean World Travel Fair and Expo or the 25th Korea World Travel Fair (KOTFA2012) and COEX (Convention & Exhibition Center) has the biggest participation by international and domestic tourism related organizations among the travel exhibitors in Korea. Recognized by international and domestic tourism authorities including WTO, The Ministry of Culture & Tourism in Korea, Seoul Metropolitan Government and Korea National Tourism Organization, the event is an open market for buyers and sellers for business talks and negotiations; an open stage to provide world folklore performances and experience programs and a valuable forum to exchange views, news, trends and ideas related to world tourism industry. UC, which is home to several board topnotchers and student champions in several fields including arts and culture, is tagged the University of Champions, is a world-class educational institution that offers low rates and no tuition fee increase until you graduate plus over 7,000 scholarships available.